Last Sunday saw the first round of 2013 in the Indikart Championship at Hooton Park - a week late due to the snow the previous week. 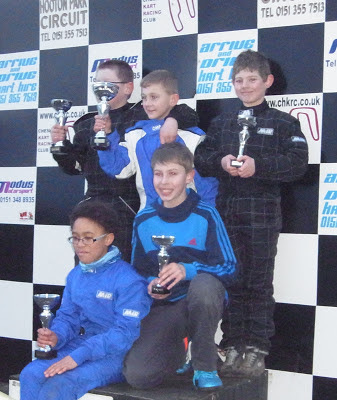 There were 18 Cadet drivers on the line-up and Samuel qualified in 7th place for heat one. Here are the starts shown as a spectator and also from the GoPro Hero 3 Black camera fitted to his helmet. Heat One - started in 7th place and by the first corner he was leading the race! He finished the race in 4th place (top 5 finished on the podium) with Lee and Alex from the Championship Karting team finishing in 2nd and 3rd, it meant that the team were all podium finishers! Round 2 is this weekend!